The Science Council’s CPD Awards are back for the fourth successive year. The CPD awards are designed to celebrate the professional development efforts and achievements of registrants across the four Science Council registers: Registered Science Technician (RSciTech), Registered Scientist (RSci), Chartered Scientist (CSci) and Chartered Science Teacher (CSciTeach). Find out more about the 2017 award winners here. Once again this year, nominations have been made by licensed professional bodies, by employers and also by individuals. 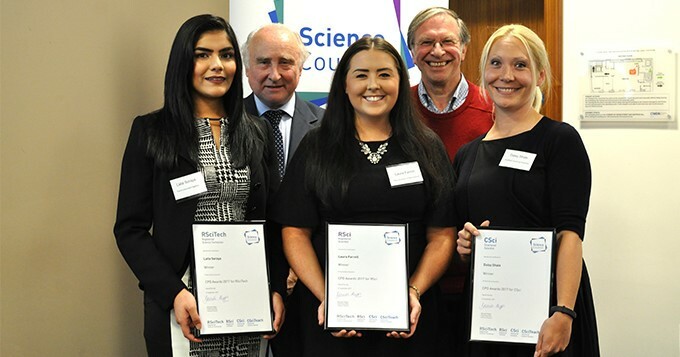 Photo (L-R): 2017 CPD Award winners: Laila Soraya RSciTech; Professor David Croisdale-Appleby, Past Chair of the Science Council; Laura Farrell RSci; Trevor Lewis, Chair of the Science Council’s CPD Learning Group; Daisy Shale CSci.